In the cold days ahead it is comforting to know that spring will soon be here. The landscape architects, installers, gardeners and administrative people that are Wallace Landscape Associates, wish you and yours a wonderful holiday season and a bright and happy New Year. Do you do this, or something like it, year after year? You could have a colorful fall garden that re-emerges every year in celebration of autumn. Containers can also be updated for fall with a selection of ornamental grasses and late blooming flowers. 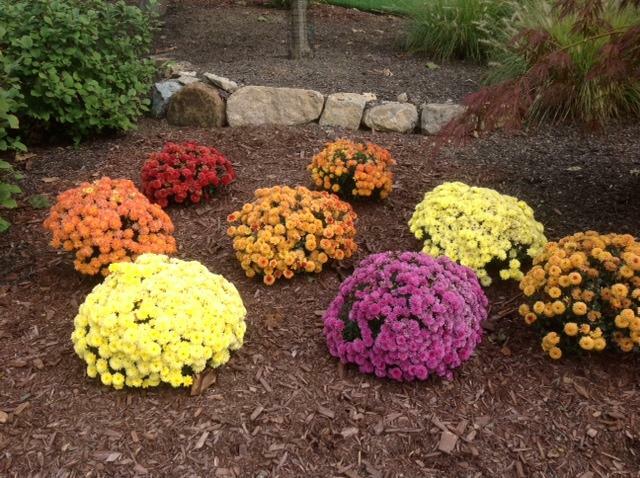 Such plantings remain attractive long after those ubiquitous mounds of mums have faded. 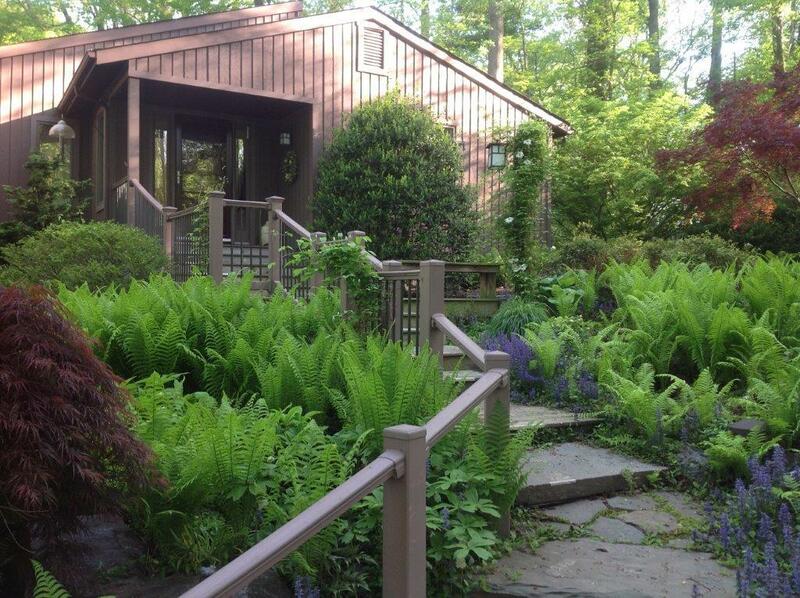 Autumn and spring are the seasons when our Mid-Atlantic weather invites us to get out and enjoy our gardens. They are absolutely the most colorful and enjoyable months of the garden year. October is a great time to evaluate your whole landscape and to make any needed improvements. A thorough clean up in the autumn is also advisable. It not only keeps your landscape looking good, it helps keep plantings healthy by removing dead leaves that may harbor insects or disease vectors. Days are getting shorter and nights are refreshingly cool. Autumn is right around the corner and winter is close behind. With the busy days of summer over, September is a wonderful time for strolling in the garden. 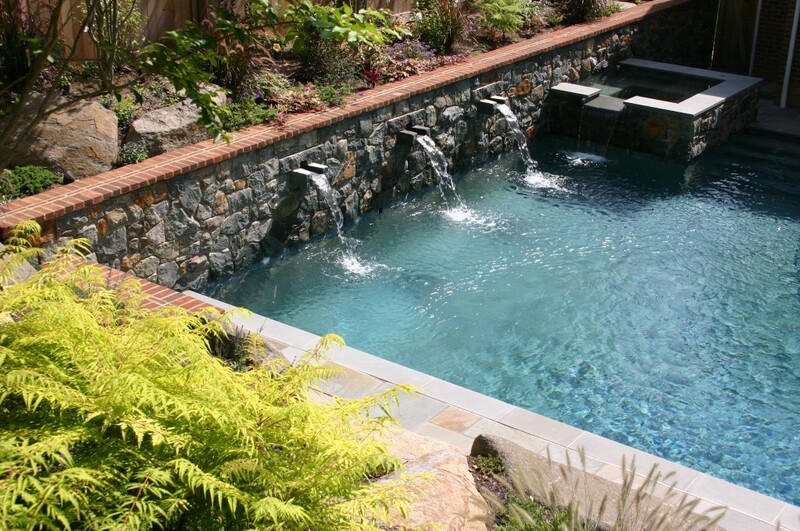 Have you gotten all the enjoyment you want from your landscape this summer? Does it truly reflect your lifestyle? 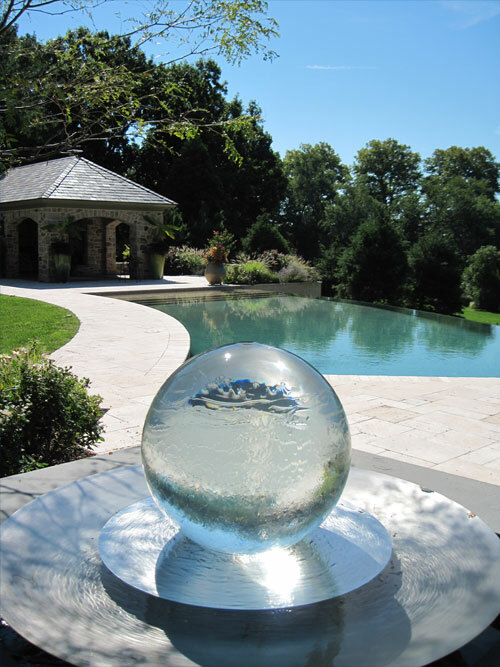 Would a water feature create a splash of special interest. Sweeps of spring bulbs are a glorious way to announce the arrival of spring. This is the time to think about next summer and the many pleasures of your garden. Subject to the forces of nature, dynamic growth and decline, a landscape is ever changing. An alteration in lifestyle often demands a landscape makeover. After a time even the best planned landscape may require some refinement and updating. I had the privilege of visiting some wonderful public gardens this month. Among them was the Grounds for Sculpture in Hamilton, New Jersey. This 420 acre garden has been designed with great creativity as a setting for a large and ever growing collection of sculpture. Near perfect maintenance supports the design intent. A day in this garden is marked by a series of enchanting and surprising experiences. July is hot and August is hotter. This is the time to kick back around the swimming pool and keep cool. I’m planning a trip to visit historic homes and gardens in Virginia. I’ve printed out a detailed map to guide me to my destination. Even with my GPS I have found I need to have a map in hand. The GPS doesn’t always send me on the best route and it doesn’t consider recent changes in roadways. With a map I can be sure I will reach my destination without a problem. I’m one of those strange people who loves a rainy day. As an avid gardener I worry when the weather is dry, especially at this time of year when plants growth is just getting started. So I’m enjoying the rain today. Sunday was one of those early March days that foretell of spring to come. It was 57°. The clouds parted for a while and a rather weak sun appeared in a pale blue sky. The earliest crocuses and snowdrops called to me and I had to get outside. I spent the day cutting back perennials and ornamental grasses, pruning and cleaning up winter’s debris. The heavy winds had blown leaves into the beds. Twigs and even tree limbs were everywhere. It was hard work, but satisfying.